Do you use the Calendar a lot, and want Outlook to display the Calendar first (when we open the application), instead of your Inbox? 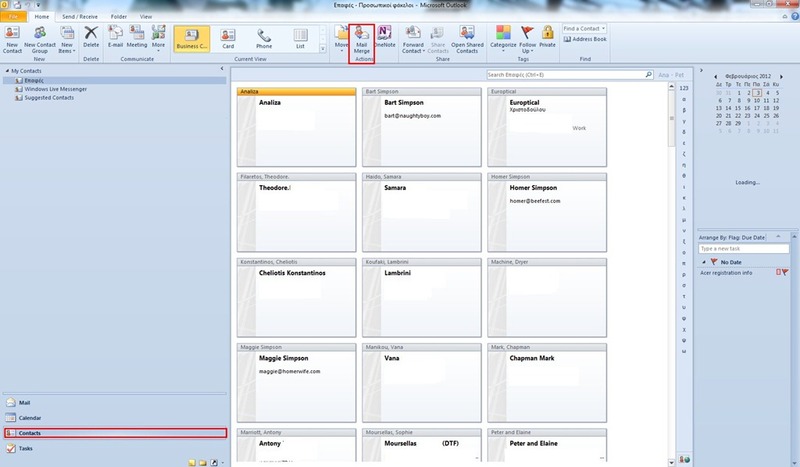 Or do you want Outlook to display your Contacts? First of all we must select the File tab in order to go to backstage view and then from the drop down menu to select the command Options as we can see in the image below. The Outlook Options window appears where from the left of the window we select the category Advanced. Then from the right of the window and under the area Outlook Start and Exit, we locate the command Start Outlook In This Folder. Then from the right of the command we select the Browse button. The Select Folder window appears where we just select the folder that we want. The next time we start Outlook the default folder that will appear will be the one that we selected. 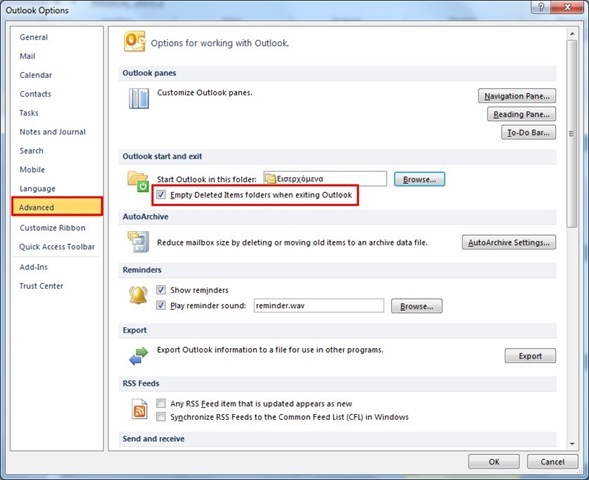 Below you can check out the video describing on how to set Outlook to change the default folder when it starts. Comments Off on How to setup Outlook to change the default folder that Outlook starts. We have all heard about the Conversation feature in Outlook 2010 (the way that we can sort and link our emails by conversations). What happens though when we want to Clean Up a Conversation and specify a folder for all the deleted messages to move to? The tip below will show you, how can it be done. 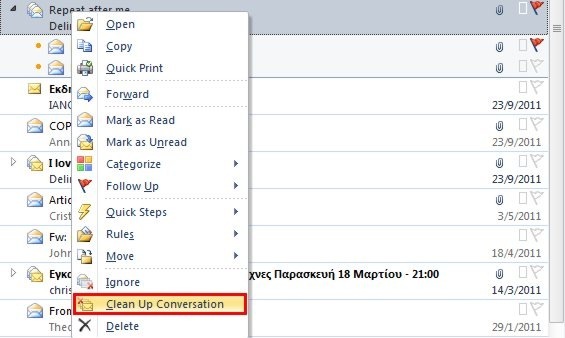 The simple way for this to be done is to select the Conversation and then right click on it, and from the shortcut menu that appears we can select the command Clean Up Conversation as shown in the image below. The Clean Up Conversation warning dialog box appears as we can see in the image below. 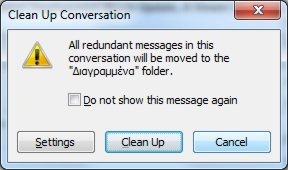 This dialog box notifies us that all the redundant messages in this conversation will be moved in the Deleted Folder. From the above image we can select the Settings button, or the second way is to select the File tab, and from backstage view to select the command Options as we can see in the image below. One way or the other the Outlook Options window appears. From the left of the window we must select the category Mail if it is not already selected. Then from the center of the window we must navigate in order to locate the category Conversation Clean Up as shown below. Then we select the Browse button in order to locate the folder that we want to specify in order for all the Conversations to be stored. The Select Folder dialog box will appear where we just select the folder that we want all our Conversations to be stored as we can see in the image below. We then press the OK button twice in order to close all the open windows, and from now on, every time we Clean Up a Conversation, they will be stored in the specified folder. 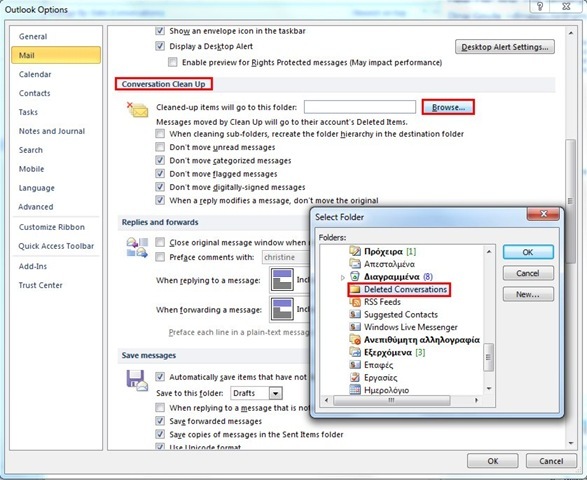 Below you can check out the video describing on how to define the folder for the Conversation Clean Up function. Are you fed up by emptying the Deleted Folder every time you exit Outlook? This tip will show you how to setup Outlook to empty the Deleted Folder every time we close the application. All we have to do then, is to agree or not with the confirmation dialog box. The Outlook Options window appears where from the left of the window we select the category Advanced. Then from the right of the window and under the area Outlook Start and Exit, we activate the check box next to the command Empty Deleted Items Folder When Exiting Outlook as we can see in the image below. We then press the OK button in order to return to Outlook. Every time now that we close the application the following warning window will appear, asking us if we want to delete all the items and subfolders in the Deleted Items Folder for all accounts. It is up to us to agree or not. 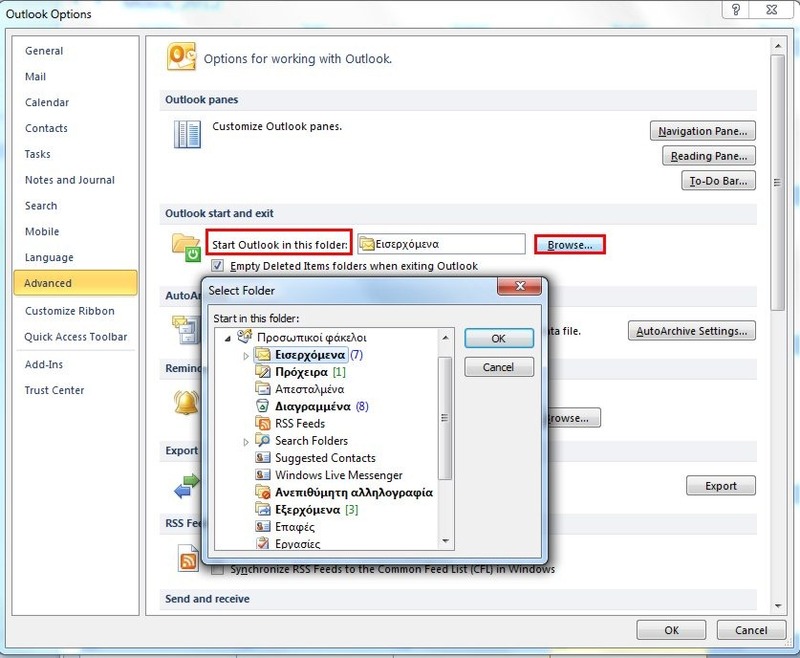 Below you can check out the video describing you on how to setup Outlook to empty the Deleted Folder automatically. First of all, what is a Form Letter? It is a letter with standard text that has been printed over and over but with a different name and address printed on each copy. In order for us to create a Form Letter in Outlook we must follow the below procedure. First we must start Outlook and from the left area of the screen we must select the Contacts button in order for the contacts to appear. 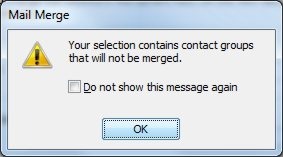 Then from the area of the ribbon named Actions we select the Mail Merge button (this procedure is for Outlook 2010). For the users of Outlook 2007, we select the menu Tools and from the drop down menu that appears we select the command Mail Merge. 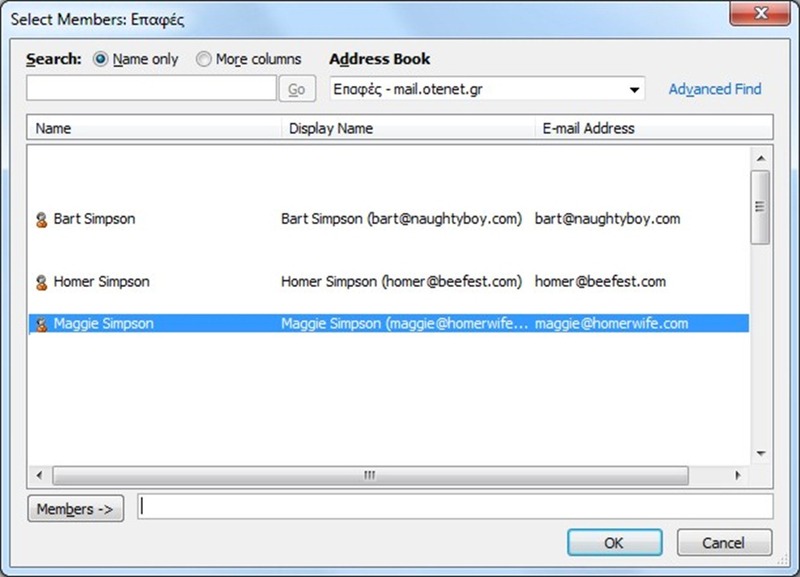 Whatever version we are using the Mail Merge Contacts window appears. 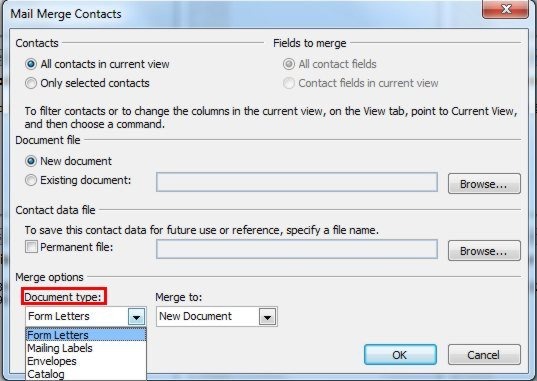 Once the Mail Merge Contacts window appears, from the area of the window which is named Merge Options and is located at the lower left corner of the window we select the Form Letters option from the drop down menu. Once selected the Form Letters appears once we have made our choice. Now the Merge To list is located at the right of the Document Type, where we must select the New Document options from the drop down menu. Usually it appears automatically but we check it just in case. Once we have done the adjustments, and by pressing the OK button, a warning window will appear notifying us that we have contact groups in our contacts that will not be included in our mail merge, as shown in the image below. In order to continue we press the OK button. Outlook starts exporting our Contacts and after a little bit Microsoft Word starts up, displaying a blank document. Here we type our Form Letter. 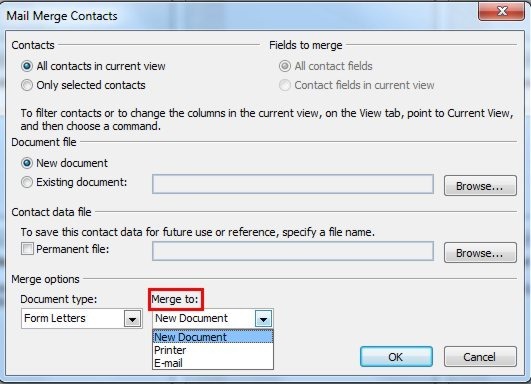 Once finished typing our Form Letter all that is left to do is to Insert Merge Fields everywhere that we want the data from our Outlook Address book to appear in our form letter shown as shown in the image below. Why do we flag an e-mail message? Well the reason is obvious! For us to do our job quickly! So how can we flag a message fast and easy? 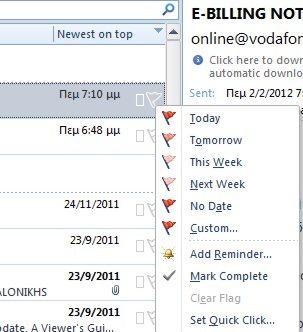 First of all we have to select our Inbox folder, where at the right of the Subject line of the message appears we notice a grey outline of a flag. Once we click on it, the flag changes from grey to red. Every time now that we look at our messages, we will know at which messages we have to pay attention to. 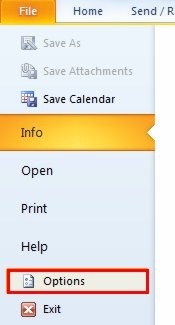 The messages that we flag show up also in the To Do pane, which appears in the bottom right area of the Outlook screen. Once we have finished with the flagged message, if we click the flag again, it will be replaced with a check mark, notifying us that we have finished over viewing the message. As mentioned above, when we mark a message with a flag; it appears also in the To Do pane, with other tasks that we have scheduled. What happens though when we don’t want to read that specific message today, but the next day or even the next week? 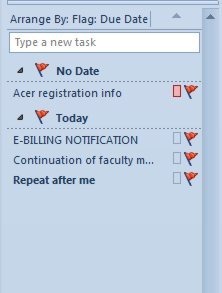 If we right click on the flag icon, a list with due dates will appear which includes Today, Tomorrow, This Week, Next, No Date and Custom. All we have to do is to select the date that we want from the list. That can also be done by dragging and dropping the item from the To Do pane. For example we can drag one date from the Today group to the Next Week group by using drag and drop. If the due date has passed without us having done any changes to the message, then the message heading will by highlighted in red color as well as in the To Do pane as shown in the image below. 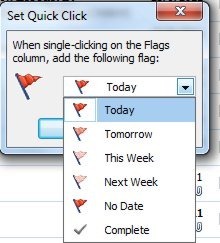 If we want to change the default due dates of the flags, we must do a right click on any flag and from the shortcut menu to select the command Set Quick Click. The Set Quick Click window appears where we can choose whatever we desire as we can see in the following image. If we want to clear a message from a flag that we accidentally highlighted with, we must do a right click on the flag and from the shortcut menu that appears to select the command Clear Flag as shown below. Many of us send out messages repeatedly which always involve the same text over and over again. For example, when I want to thank someone for their order and to inform them about the shipping detail, I store the text of those messages as Quick Parts in order to save time. 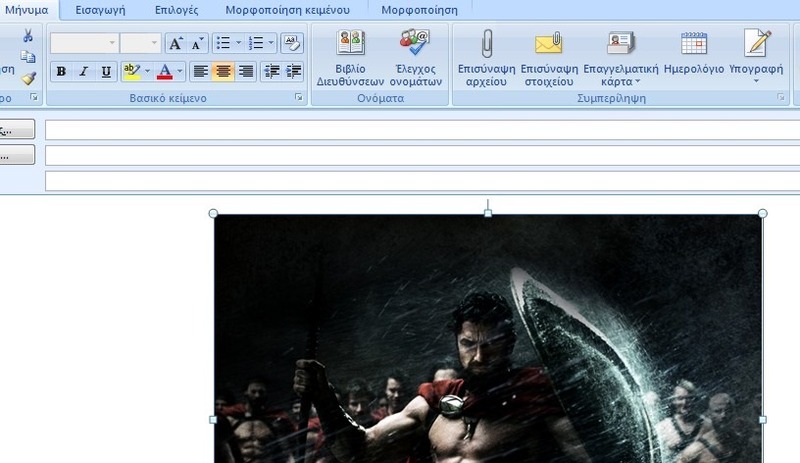 In order to add text as Quick Parts, we must type in the text that we want to appear in the body of the e-mail and once finished, we select it. Then we select the Insert tab and from the area of the ribbon named Text we select the Quick Parts button as we can see in the image below. From the drop down menu of the Quick Parts button we select the command Save Selection To Quick Part Gallery. 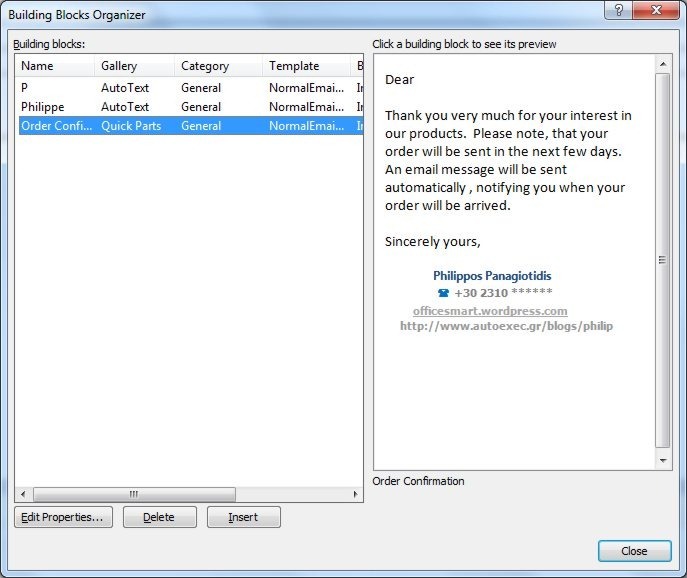 Once selected the Create New Building Block dialog box appears in order for us to do the adjustments that we want. In my example I only have typed in the name of my Quick Part. When we are finished with all the settings we press the OK button. Create a new message and activate the body of the message. 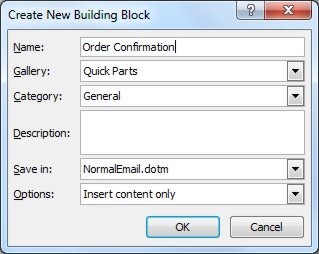 Then we select the Insert tab and from the area of the ribbon named Text we select the Quick Part button and from the drop down menu we select the Quick Part named Order Confirmation (for my example) and the text is inserted in the body of the message. Our message is ready to be sent, as long as we have inserted a recipient’s address and a subject for our message. In order for us to edit the properties of the Quick Part or to delete it we must to a right click on the Quick Part and from the shortcut menu that appears we select the command that we want. In the image below I have selected the command Organize and Delete where the Building Blocks Organizer window appears. In this window we can see a preview of our Quick Part at the right and at the bottom of the window we can Edit Properties, Delete or Insert the Quick Part. 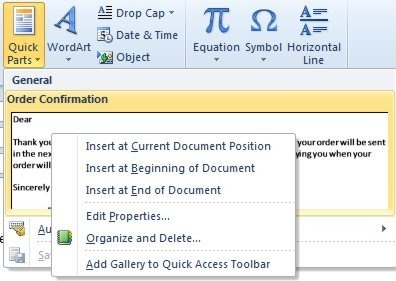 Quick Parts are also available in Word and they are at the same exact location as in Outlook. Tab Insert, area of the ribbon named Text, where we select the Quick Parts command. Many times we are ready to send an E-mail message with image attachments and we realize that the images sizes are to big to be send. What do we do? Once we have attached the image(s) for our e-mail, we must select the File tab in order to go to backstage view. Once in backstage view we select the category Info as shown in the image below. At the right of the Info backstage view we notice the Image Attachments area, with the description below mentioning that maybe some recipients will not be able to receive this message because of the attached image. Also it mentions that we can reduce the size of them in order for our message to be sent. Once we have chosen to resize large images, all the images attached are reduced to a maximum resolution of 1028 x768 pixels. Once we have done the adjustment that we want, we select the Message tab in order to return to our message, and once we have finished typing our message we press that Send button. In order to reduce the size of an image that we have inserted in the body of the message, the procedure is different and will be described in a further post. We must create a message using HTML formatting as we can see in the image below. 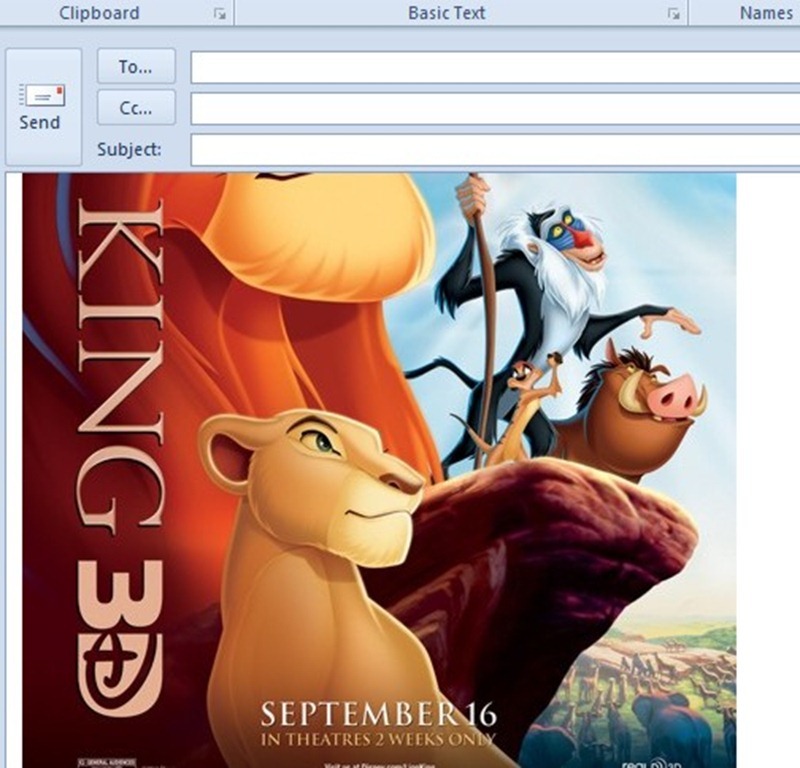 Then we position the cursor where we want our image to appear in the body of the message and then we must select the Insert tab. From the area of the ribbon named Illustrations we select the command Picture as shown below. The Insert Picture window appears, where we must select the image we want to insert into our message. Once selected, we press the Insert button in order for our image to be inserted. In order to insert multiple images we can use the Ctrl key to insert them all at once. The image (s) has been inserted now in the body of our message as we can see at the image below. As we can see at the Illustrations area of the tab Insert, except for inserting a Picture we can insert also Clip Art, Shapes, SmartArt and Charts. Clip Art: includes drawings, movies, sounds or stock photography that illustrates a specific concept. Shapes: We can insert ready-made shapes, such as rectangles and circles, arrows, lines, flowchart symbols, and callouts. SmartArt: We can insert a SmartArt graphic that visually represents information. The SmartArt graphics range from graphical lists and process diagrams to more complex graphics, such as Venn diagrams and organization charts. Chart: We can insert a chart to illustrate and compare data. Some available types of charts are Bar, Pie, Line, Area and Surface. 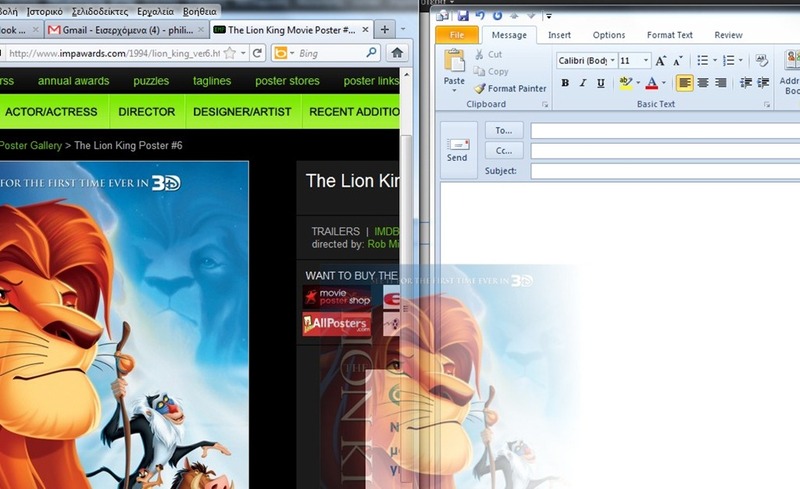 Screenshot: We can insert a picture of any program that is not minimized to the taskbar. How can we insert an image that we have found on a web site? We create a message using HTML formatting and then we open the web page containing the picture that we want to insert. Then we can drag and drop the image from the web page to the location we want in our email message. As we can see at the image below, by using the drag and drop technique we can see the image that is been moved into the body of the message. The catch is that when we use the drag and drop technique, instead of the image been inserted, the link of the image is inserted instead as we can see below. Alternatively for better results, we can right click on the image in the web page and from the shortcut menu to select Copy, then insert our cursor in the body of the message we want to add the image and then right click again and from the shortcut menu to select Paste. The image will be inserted in the body of our message as shown below. A lot of times it will occur to us that we want to send an email to as many people as possible. In other words we want to send the message to a mailing list. 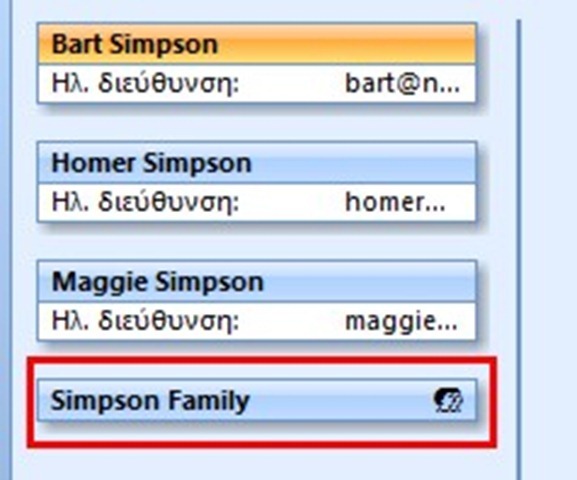 Contact Group is what it is called in Outlook. By using a Contact Group, we can send an email to a group of people very easily. 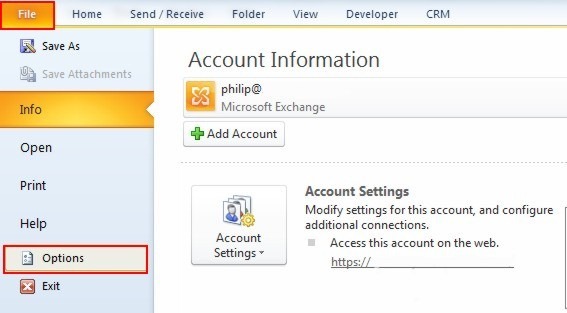 In this post I will to describe how to set up a Contact Group in Outlook. We must start Outlook, just in case that we haven’t. Then from the main screen of Outlook, we select the Home tab and then select the New Items button. From the drop down menu that appears we select the command More Items and then at the right we select the command Contact Group. An alternative way is to press the button Contacts which is shown at the bottom of our screen and then to press the New Contact Group button from the area of the ribbon named New as we can see in the image below. 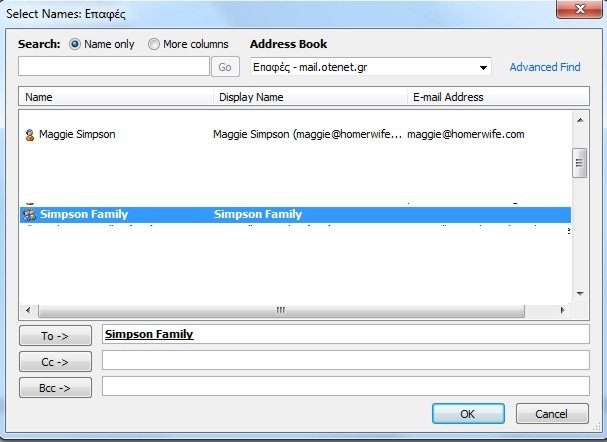 Whatever way we use the same dialog box will appear which is named Contact Group as shown in the image below. Now we have to select the command Add Members and from the drop down menu we can select members from Outlook Contacts, From Address Book, or New E-Mail Contact. By selecting any one of them the Select Members: Contacts window appears. In this window we must select the contacts that we want to add and press the Member button which is shown at the bottom of the window in order to add it to our Contact Group. Once we have added the members that we want we press the OK button. Once we have pressed the OK button we return to our Contact Group window, where in the area named Name we must type in a name for our Contact Group. If we want to add a member that is not already in our Contacts we must select the New E-Mail Contact command from the Add Members drop down menu and type in all the necessary fields. Once we have finished with our Contact Group and typed in a name for it we press the Save & Close button as shown below. Once we have created the Contact Group, we want to add it to a new message. Once we have created the new message we must select one of the fields To:, Bc:, Bcc:, in order to open the Select Names: Contacts window, where all our contacts are shown as well with our Contact Group that we just created. We select it as we can see below and then we select in which field we want to add it to. In the following image I have inserted it in the To: field and if I don’t want to add any other contacts for my message I press the OK button. The Contact Group name will appear in the corresponding field that I had inserted it and my message is ready to be sent. The Contact Group icon differs from the contacts icon as we can see in the image below. 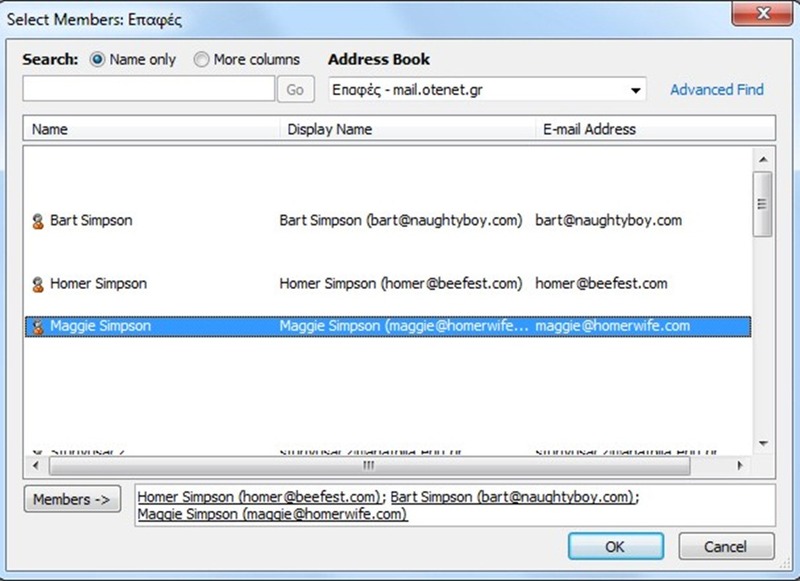 Many times we type in an e-mail address in the fields To:, Cc:, Bcc:, we notice Outlook suggesting different addresses according to the letter that we have typed. This function to some people may seem very useful and to some very annoying. In the image below I have typed the letter c and straight away the suggested addresses appear where we just select with our mouse the name that we want to, and straight away the whole recipients address is imported to the according field that we had selected. 1. Once I have started Outlook 2010, I select the File Tab, so we can go in backstage view and from the menu with the available options I select the Options command as shown in the image below. 2. Immediately the Outlook Options window appears, where on the left where all the categories are we should select the Mail category as we can see in the image below. 3. 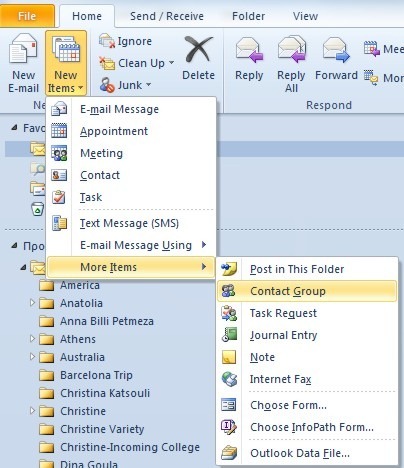 Once we have selected the Mail category from the Outlook Options window we navigate further down in the window until we locate the Send Messages category at the right of the window, where we should enable or disable the command “Use Auto Complete List to suggest names when typing in the To, Cc and Bcc Lines”. That’s just about it. We also can clean the Auto-Complete list just by selecting the button Empty Auto-Complete List. Once we press the button a Warning Dialog Window will appear asking us whether we are sure or not to empty it, by clicking on the appropriate buttons Yes or No.